Often when an owner looks to change their dogs problem behaviour they solely focus on fixing the issue they see. However in order to facilitate real change we usually need to look at the bigger picture as often the problem we are seeing is only the top of the iceberg. 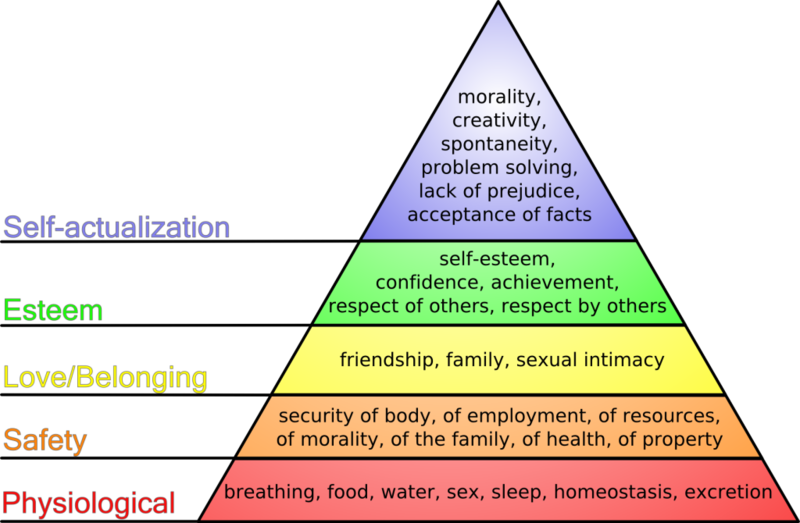 Some of you may be familiar with Maslow’s hierarchy of needs – a psychology concept that looked at the various needs people have to satisfy in order achieve self-actualisation. The concept is often illustrated in a pyramid structure. This same concept can be applied in various forms to all living beings. Therefore when looking at behaviour modification with our dogs it is helpful to also look at their needs in a similar pyramid system – with increasing importance from the base to the top. Only once all steps on the pyramid have all been satisfied can we hope to have a happy, healthy, well rounded dog. If a dog is unwell or experiencing pain there is no point in trying to address any behaviour issues or undertake new training. Any potential for improvement or progress it going to be impacted on by how the dog is feeling. 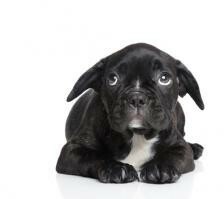 Equally pain can make your dog more unpredictable and therefore potentially more likely to show aggression. Note: If you dog has experienced any recent change in their behaviour it is essential that you consult your vet and arrange for them to be checked over. Equally if your dog appears dull or just not themselves a quick visit to the vet will ensure that you have ruled out any medical cause or contributing factor for your dog’s behaviour. Regular health checks and keeping up to date with vaccinations and parasite control is also very important. Bruno was a dog that had bitten 5 times within a three week period in a new home. Each time the behaviour was “out of the blue” and in various different situations. His family were stumped and it was only after a thorough veterinary check that it was discovered that he has a painful lower spinal issue. He was not displaying any outward symptoms apart from having a bit of a “jaunty” walk. Thankfully with some pain relief and a reduction in his exercise and introduction of new bed options his behaviour was significantly improved. 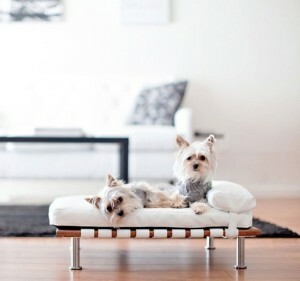 When we, as humans, don’t feel safe or in control of our environment we experience high levels of stress and anxiety, the exact same is felt by our dogs. Prolonged or repeated exposure to something that makes our dogs feel anxious or frightened is going to significantly impact on their behaviour. In order to helps our dogs we need to identify the things that make them feel worried and reduce and if possible eliminate them from their life. When it is not possible to remove the stressor completely, for example a dog that is worried about being left, you need to work on changing their existing association from a negative to a positive. The knock on effect of all work on his separation issues means Buddy is once again more relaxed around unfamiliar people. Maintenance behaviours, as the name suggests, are all the behaviours that we & our dogs, as mammals, need to do to survive. If any of these are lacking this will directly impact on our physical and mental wellbeing. As owners we need to make sure we are promoting all of the maintenance behaviours as much as we possibly can as if these are lacking in any respect it is very difficult for a dog to function normally, let alone learn new behaviours or overcome existing anxieties. In order to help ensure your dog is successfully achieving all of the maintenance behaviours carefully consider all of the five elements and mentally tick them off if you are happy that they are being met. If you are in doubt about any element not being satisfied perhaps consider how you can help them to achieve whatever is lacking. You can perhaps create a list of various opinions that you can offer your dog in order to try to promote the maintenance behaviours they are not achieving successfully. Boo is a long term resident of Dogs Trust. When he arrived into the Centre it became quickly apparent that he was toilet trained and would hold everything in until he was brought out on a walk. This without a doubt directly impacted not only on his behaviour, he was really wound up when the staff would enter his kennel (as he was desperate to get out) but also on his health which manifested in his coat condition deteriorating. In order to try to encourage him to alleviate himself he was offered various “toilet” options in his kennel – a privacy screen, a grass sod filled wooden box, a small traffic cone with foliage tied to it and a large litter tray with sand in it. In the end the sand box with some upright foliage at the back was the winner! It took months of perseverance and he would still rather go out on his walk but Boo will now toilet in his kennel and as a result he is a much happier and healthier dog. Dogs are a naturally social species and are hardwired to want to be with others. 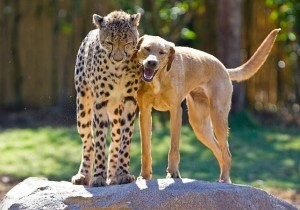 Depending on their early socialisation this can be any other animal – people, dogs, cats, horses, even a cheetah! We have bred dogs for literally thousands of generations to be “people friendly” and the knock-on effect of this is that often then don’t do very well when they find themselves separated from the humans in their lives. For some dogs, even having a doggy pal is not sufficient, due to their high motivation to be with people. So in effect some degree of regular social interactions are essential for all dogs. It is however, important to note that what is appropriate for one dog is not necessarily going to be the same for the next dog. For example some dogs love other dogs and some do not, some dogs love a cuddle where as other find physical contact overwhelming. Therefore is necessary for you to really understand your own dog and the type of social interaction they enjoy. Once you have established this you can try to promote as much social time as possible. Rosco is a large male Rottweiler that has a history of being reactive, barking and lunging on lead when he saw other dogs. His owners were worried about letting him up to say hello in case he lunged out and hurt the other dog or equally as he was muzzled (as a restricted breed) that they would attack him and he would be unable to defend himself. Physical exercise is important for all living things as it releases endorphins into the bloodstream and can help to encourage physical wellbeing. It also has the advantage of preventing boredom and encouraging mental stimulation. 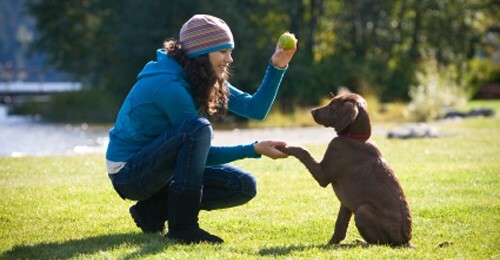 As with social interactions it is important that the exercise we do with our dogs is tailored to their specific needs. There is no point in taking an elderly, arthritic dog out for a 4 hour hike and expecting them to be relaxed and happy afterwards. 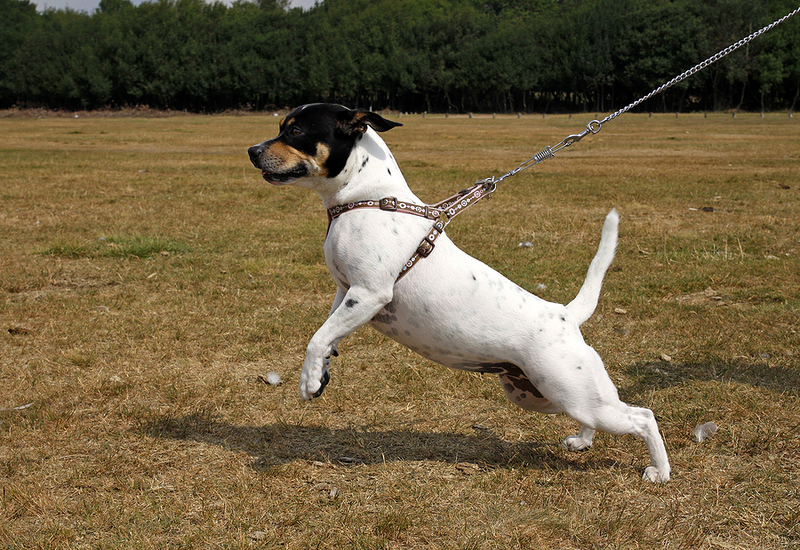 Equally for some very high energy and impulsive dogs, going for a run, will just build stamina and make them even harder to tire out – these guys need a walk that is about working their body and their brain e.g. tracking. 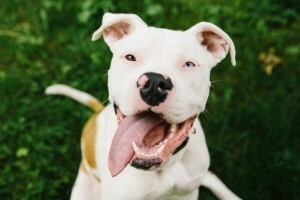 Dogs (& people) will not play if they are stressed and you will often hear owners of shelter dogs say he didn’t play until he was several months in the home i.e. until the first 4 steps in the pyramid we achieved. 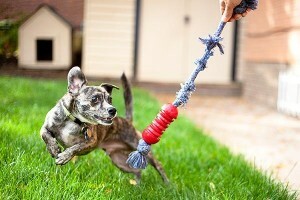 If you can encourage your dog to object play either with you or alone fantastic. If your dog doesn’t appear interested in playing try to offer then lots of different options and be patient, it might take a while but chances are they will get there in time. Robbie was a long term resident of Dogs Trust that despite being surrounded by a variety of novel toys every day in his kennel and regular trips out to an exercise area with lots of different things to play with he never interacted with any of the things he was offered. He would spend long periods of time sleeping in his kennel and despite being excited to see them he never really looked to have any physical contact with his carers. Robbie then went to live in the office for a couple of weeks due to a shortage of kennel space. This space, with the same two staff members providing his care allowed him to feel safe and secure enough that he started to play. The knock on effect of this was that he also started to actively seek to be petted by the people in the office – success! Robbie has subsequently gone to a new home – super duper success! Addressing the problem behaviour through appropriate training. Only at this point in time is your dog really ready for truly effective behaviour modification. Your dogs are healthy and safe, they have their physical and social needs met and they are receiving appropriate exercise and play time. To tackle any problem behaviour we must first identify what is the underlying cause. Once we have established this we can work out a tailored plan to change how the dog is feeling and ultimately through this their behaviour. JJ – Example of how to the address a problem behaviour through appropriate behaviour modification and training. JJ is a beautiful Spaniel crossed owned by an amazing young family. However in the past year JJ became increasingly anxious about being handled and had escalated to air snapping and showing his teeth when touched. In order to help him with this his family committed to a plan where JJ would only be touched if he solicited fuss from his family. They also worked on a three second rule where they would initially pet him for three seconds and then removed their hands – if he stayed put they could continue gently petting him but if he moved away they left him alone. This allowed JJ to feel some control over the situation giving him back some of his confidence in relation to being fussed. In conjunction with this they also worked on a structured handling program. The program again involved lots of choice for JJ and a solid positive association was created with hands approaching him via the use of well-timed high value rewards. This combined approach allowed JJ to understand that fuss was in fact a good thing and the growling and showing of teeth was significantly reduced. Any questions, as always, pop them in the comments section below.